An analysis of a school behavior strategy—known as School-Wide Positive Behavioral Interventions and Supports (SWPBIS)—found that these types of programs significantly reduced children's aggressive behaviors and office discipline referrals, as well as improved problems with concentration and emotional regulation. The study, conducted by researchers from the Johns Hopkins Bloomberg School of Public Health, is the first randomized control trial to examine the impact of SWPBIS programs over multiple school years. The results were published October 15 in the journal Pediatrics as an eFirst publication.SWPBIS is a prevention strategy that aims to alter student behavior by setting universal, positively stated expectations for student behavior that are implemented across the entire school. Policies and decisions related to student behaviors are based on data analysis. SWPBIS programs are used in more than 16,000 schools in the U.S."These findings are very exciting, given the wide use of SWPBIS across the country. These results are among the first to document significant impacts of the program on children's problem behaviors, as well as positive behaviors, across multiple years as a result of SWPBIS," said Catherine P. Bradshaw, PhD, MEd, lead author of the study and associate professor in the Bloomberg School's Department of Mental Health.The randomized trial included a representative sample of 12,344 elementary school children from 37 schools. Approximately half of the students received free or reduced-priced meals, and nearly 13 percent received special education services. 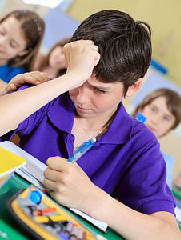 The researchers analyzed teachers' ratings of students' behavior and concentration problems, social-emotional functioning, pro-social behavior, office discipline referrals, and suspension over 4 school years.Overall, the study found significant improvement in children's behavior problems, concentration problems, social-emotional functioning, and pro-social behavior in schools using SWPBIS. Children in SWPBIS schools also were 33 percent less likely to receive an office discipline referral than those in the comparison schools. The effects tended to be strongest among children who were first exposed to SWPBIS in kindergarten. "A unique feature of the model is the overall structure that is formed in schools to support sustainable services for students across a range of behavioral needs LCSW Continuing Education Using this framework, school staff can identify students at greatest need of services and efficiently target programs and resources to them," said Bradshaw.###The author of "Effects of School-Wide Positive Behavioral Interventions and Supports on Child Behavior Problems" include Catherine Bradshaw, PhD, MEd; Tracy E. Waasdorp, PhD, MEd; and Philip J. Leaf, PhD.